Every little child always wants to be either an actor, athlete or a rock star. Thanks to our parents who will always do anything and everything in their power to see us achieved our dreams which at sometimes seem to incline on a more musical side. The music world truly has the most expensive guitars. And that is not because they have a big price tag for being the first in the make but for being the best in terms of material and design quality. 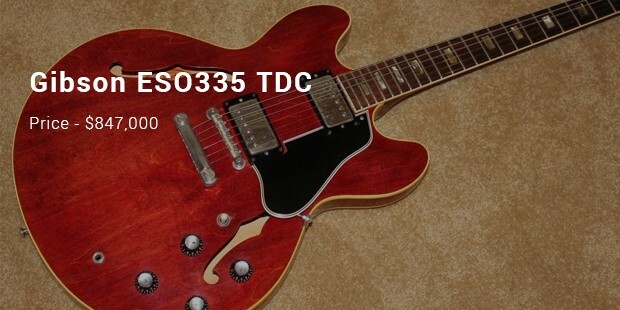 If music is your thing, you want to live, breath and eat it, and if guitar is your passion, then you need the best one, perhaps knowing the most expensive guitars would do to help you make a selection. Here is the list. 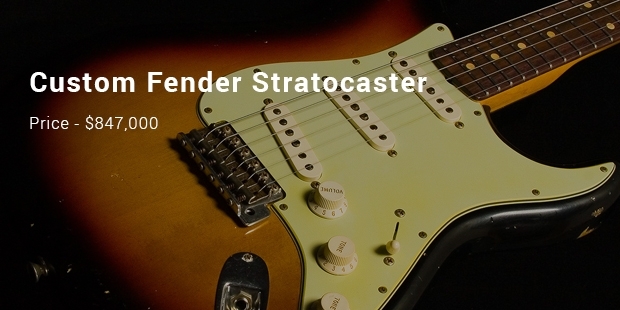 A Fender Stratocaster is a type of guitar that uses electricity in order to operate. It is of a high price, which is estimated to be 2.7 million dollars, which is quite unbelievable. The quality of this one is a plus though, and that explains why the price tag is worth it for sure. 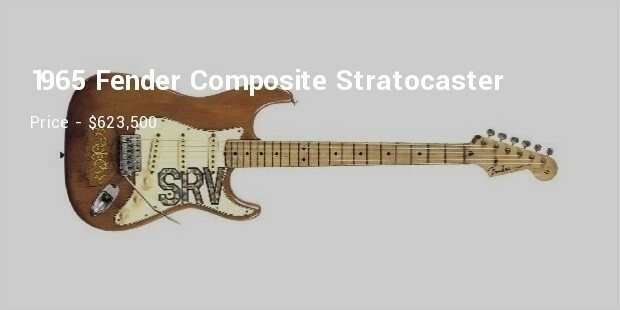 The latest 1968 Stratocaster, which cost 2 million dollars, does actually carry most features from other Stratocasters. The guitar does include an enlarged headstock and a black headstock logo. The goldish finish on the guitar was about to be overlooked atwhen it was still in Dave’s Guitars sales shop in the present 90’s. 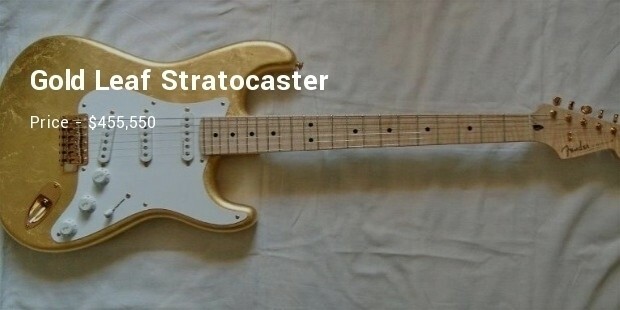 This guitar was a poor refinished Strat in an unpleasing color. This musical instrument is reported as one of the most valuable possession of Bob Marley and in fact is considered as a national asset by Government of Jamaica. This particular guitar was custom made for the reggae icon. 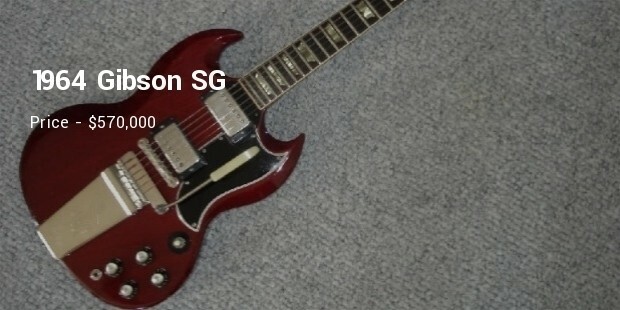 In 1971, after a gig in Vancouver, Marley gifted this guitar to Gary Carlsen, a guitar technician. 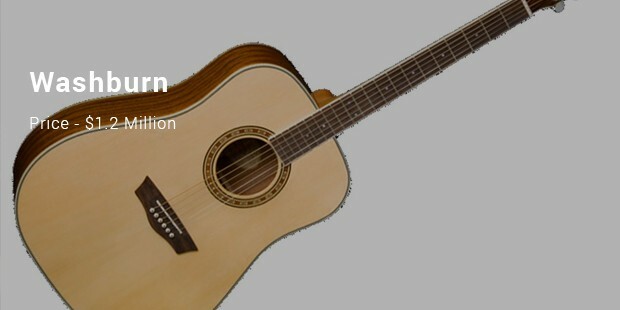 The Washburn type of guitar does cost 1.2 million dollars. It gives off the finest guitar basses, mandolins and banjos. A famous Jamaican reggae artist called Nesta Robert Marley or nicknamed Bob Marley used this guitar for high quality music performance. Nesta Robert Marley had once given a technician called Carlsen Gary a Washburn guitar, and by the way, this guitar was made for the reggae singers only at that moment. 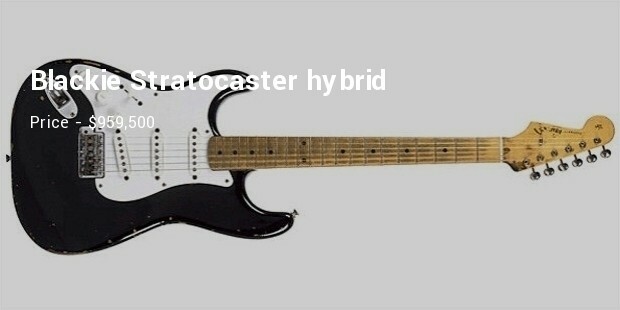 Eric Clapton nicknamed his Stratocaster as “Blackie” due because of its dark finish. Clapton first played his Blackie, live at the Rainbow Concert in 1973 & went on to play many songs until he retired in 1985 due to his neck problem. 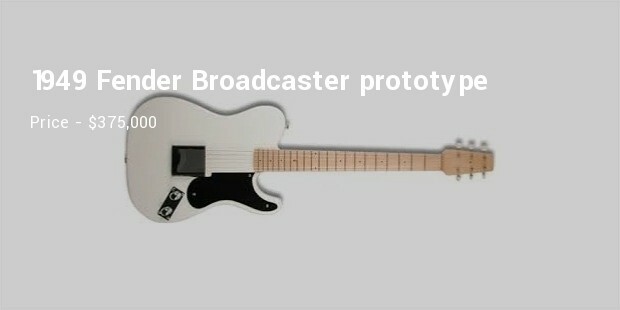 The hollow-body guitar is not just a fashionable music instrument. The guitar is a unit that has been there for a long time and its fame actually dates back to the early 1970s. Not many guitars have the feature of hollow body, and perhaps that could be the reason why this one costs $847,000 USD. Another instrument from Eric Clapton’s collection, he had to sell this one as part of a benefit for his Crossroads Rehabilitation Centre. 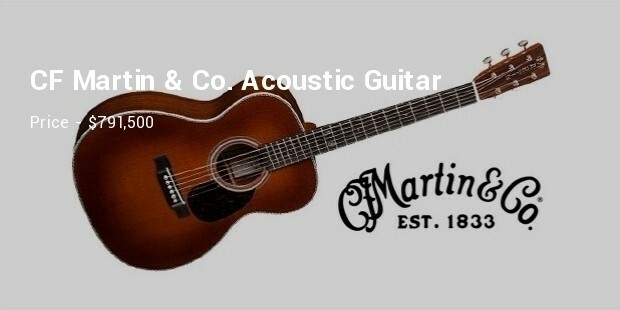 The Acoustic guitar is made from East Indian rosewood & produces a well balanced tone. 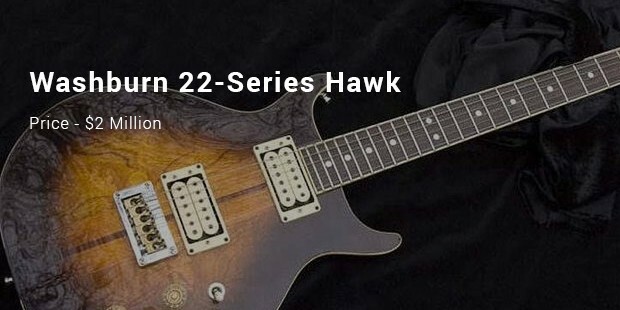 This musical instrument was a 26th birthday gift to Stevie Ray Vaughn from his wife & hence made it his favourite instrument for playing onstage. The Blue guitarist named the instrument “Lenny” after his wife’s name & that made it very special. He used this instrument extensively until his death in 1990. The Beatles used this guitar between 1966 & 1969. George Harrison used it when recording and touring for the album Revolver, while John Lennon used the same guitar during the sessions of the White album. 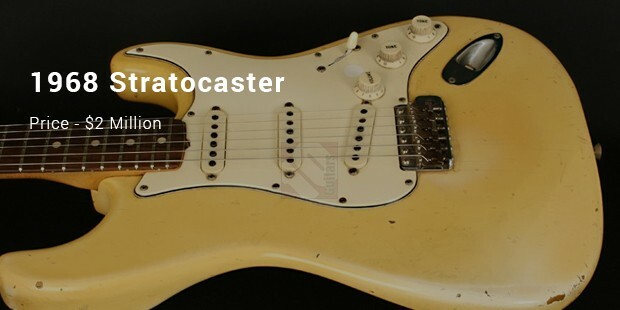 This was ordered by Eric Clapton in 1996, on Fender’s 50th anniversary. Plated with 23k gold, this was created as a museum material somewhat like the Louvre. 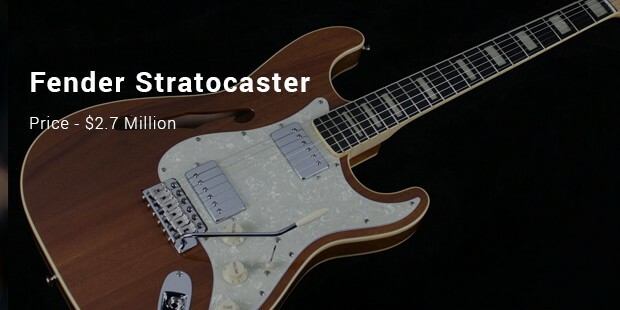 Clarence Leonidas “Leo” Fender may not be the music icon many people would imagine an icon to be, but those who know their music and guitars realize how Fender revolutionized the music industry – he helped to develop the modern electric guitar. Needless to say, Fender’s 1949 Broadcaster Prototype is considered a jewel among guitar collectors. A guitar is an instrument known to be complicated but as one tries to continue trying out new songs he or she will come out a lot better. Playing strings is ever fun, and if you have the same sensation as I do, perhaps it’s time to have a grab of one of those most expensive options at home or in your music room to be precise.